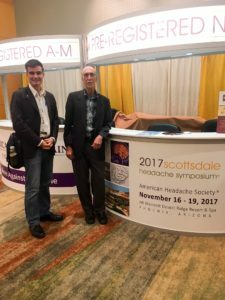 The American Headache Society (AHS) Symposium took place last month in Phoenix at the JW Marriott Desert Ridge Resort and Spa. Several of our Clusterbusters board members and President, Bob Wold, were in attendance along with one of our favorite neurologists, Dr. Brian McGeeney. There are several things we learned over the course of the four-day conference. The first notable impression we gained was the absence of Cluster Headache in both the syllabus and the minds of the physicians. AHS did a wonderful job educating medical professionals on all aspects of Migraine including diagnosis, prevention, treatment, and emerging options for patients. 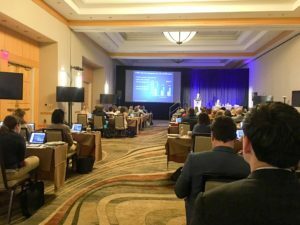 The less common headache disorders, both primary and secondary, were mentioned, but the main focus of the symposium was Migraine, which makes our attendance more essential than ever. The CGRP (Calcitonin Gene-Related Peptide) antibody studies by Teva Pharmaceutical Industries and Eli Lily & Co. are perhaps the most promising trials for cluster headache patients right now—Aside from Dr. Schindler’s study on psilocybin at Yale University. CGRP is a natural-occurring protein in the body that is believed to attach to brain receptors and activate sensory neurons in your trigeminal nerve, which instigates the severe pain of a cluster headache attack. The theory behind this emerging treatment is to inhibit or reduce the amount of CGRP released in the brain. The early Friday morning presentation involved a 3D representation of how the CGRP is released and attaches to neurons. There are four ongoing trials, two of which include cluster headaches, and three of which could be FDA-approved in 2018. A phone interview, followed by a thorough evaluation including a list of questions, physical, and urine sample. A baseline diary for up to 90 days to document the time, length, and frequency of your attacks each day. You can continue taking one preventative medication, but oxygen is the only abortive treatment allowed. This is to ensure there’s no medication overuse. Additionally, you’ll need to stop these treatments: BOTOX®, steroids, nerve blocks, illegal drugs, and marijuana. Both episodic and chronic patients can participate, but the episodic process is slightly different. Learn more at https://clinicaltrials.gov/ct2/show/NCT02466334. Most medications used to treat cluster headaches can be continued until conception but must be stopped during pregnancy. Some women are pain-free while others experience an increase in attacks or the start of an episodic cycle while pregnant. Aborting attacks with high-flow oxygen is one option, but sumatriptan, DHE, Topamax, prednisone, and other popular medications used for cluster headaches have to be discontinued to avoid birth defects, premature births, and miscarriages. Luckily, there are some safe options available for women struggling with attacks during pregnancy. 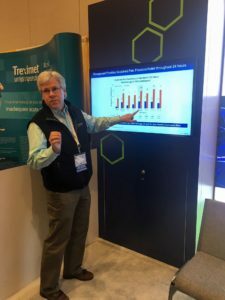 We learned during the AHS Symposium that the newly FDA-approved, non-invasive Vagus Nerve Stimulator (VNS) by gammaCore® and occipital nerve stimulation (ONS) could be used safely during pregnancy to treat attacks. 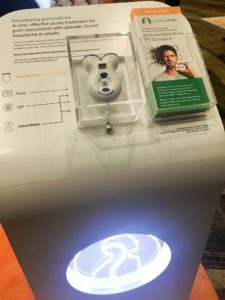 The VNS is a handheld device (seen on the left) approved for episodic and chronic cluster headaches that can abort an attack in approximately 15 minutes. Studies show that both the VNS and ONS result in less acute medication use and less medication overuse. We already know cluster headaches have a profound impact on our mental health such as the development of PTSD and depression. One of the presentations talked about the potential link between Borderline Personality Disorder (BPD) and head pain. There’s a cognitive-behavioral model of panic disorder that makes one wonder which came first. Many of us have been there—You experience a stressor that you associate with a cluster headache attack, fear of the attack develops, you take medication to “prevent” said attack when there may not have been one coming. A 2009 study focused on the psychiatric link in patients with chronic daily headache and migraine. However, in theory, cluster headaches can be looped in with the results. They found that individuals with Migraine are 2.2-4 times more likely to suffer from depression and may have an increased suicide risk. Medications can help the mental health aspect, but it’s difficult to treat both head pain and depression effectively. Given that cluster headaches are nicknamed “Suicide Headaches” because the rate of suicide attempts is 20 times the national average, this makes perfect sense to us. A 2012 study on depression and anxiety in cluster headache patients found this link was especially powerful. A Friday afternoon speech at the AHS Symposium focused on pediatric patients with migraines, and it was difficult to get one of the speakers even to admit that children also get cluster headaches (Thanks, Dr. McGeeney!). There are so many awful side effects associated with common off-label medications used for cluster headaches including Topamax that it’s hard to determine what’s actually safe for kids with cluster headaches and migraines to use. Surprisingly, the recommended preventative for kids as young as six with Migraine was Topamax. Experts agree that the average age of onset of Cluster Headache is between ages 20 and 40, but 35 percent of patients report having their first attack before the age of 20, which often results in a delayed diagnosis or misdiagnosis. We know of several children as young as eight who have cluster headaches and little to no treatment options. This is one of Clusterbusters goals right now—To develop a thorough resource for parents of young children with cluster headaches to learn more about the condition, what treatments may be viable and most importantly, safe, so the child can continue to grow and learn. Your circadian rhythms, REM sleep, and melatonin levels play an interesting role in cluster headaches. You likely know that nighttime attacks are one of the major indicators of CH, and the worst attacks to treat because you wake up with a full-blown K10. All of this makes it hard to maintain good “sleep hygiene.” A set routine is easier said than done, but it’s believed that maintaining a consistent sleep schedule may help turn chronic migraines (again, no mention of Cluster Headache) into episodic. However, the opposite may happen if you don’t stick to a strict sleep schedule. During the only main-stage presentation on Trigeminal Autonomic Cephalalgias (Cluster Headache, SUNCT, and Hemicrania Continua) an audience member asked about the Vitamin D3 Regimen and proper oxygen use and was all but met with blank stares. That drove the point home for us that we need to find a way to educate medical professionals (primary physicians, specialists, emergency responders, etc.) on the correct way to approach treatment for a cluster headache patient. The absolute first step a medical professional should take following a cluster headache diagnosis is to write a script for 12-15lpm of high-flow oxygen with a nonrebreather mask. Sadly, many physicians are under the misconception that all patients will develop oxygen toxicity at this rate, but unless there’s a pre-existing lung issue, this is not a problem. We’ve known since the 1930s that oxygen works for cluster headaches, and it’s honestly astonishing that we’re still fighting our doctors and insurance companies to provide it. Essentially, our work is far from done. Other aspects that piqued our interest involved the booths in the exhibit hall. The folks from Eli Lily & Co., electroCore, LLC, Teva, Biohaven Pharmaceuticals, Allergan, and many others lined the walls. We were met with many questions about cluster headaches and how they differ from migraines as we made our way down the circular path. Biohaven Pharmaceuticals was particularly intriguing. Not only did they have this awesome 3D printer making headphone cases, but their product is said to work well for migraines, and maybe cluster headaches someday soon. 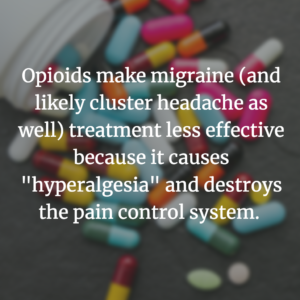 Biohaven has developed a CGRP receptor antagonist proposal that has two main goals: acute migraine treatment and prevention of episodic and chronic migraine. Currently, it comes in pill form. 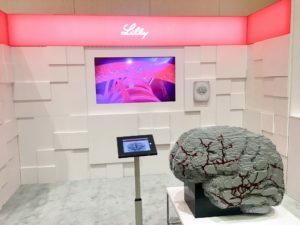 Aside from the cool booths (Eli Lily had a Lego brain approximately two feet high), we learned or were at least reminded that it’s important to be skeptical. Cluster headaches are often ignored even though it’s a primary headache disorder because of the low number of patients and misinformation about women with CH. Additionally, neuromodulation was discussed at length during one presentation and is considered the best mode of action when all else fails to work. Our board members and President were fortunate enough to be invited to the special interest meeting on the Trigeminal Autonomic Cephalalgias. 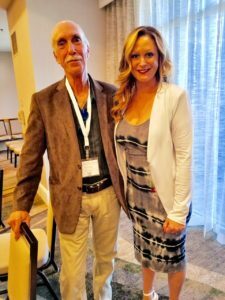 We met more than a dozen medical professionals and neurologists who were fascinated by Cluster Headache and eager to learn what their patients need from them. This was the most exciting part of the AHS Symposium for us. This meeting changed the way many of them view cluster headaches. We hope to continue working with this group on improving the diagnosis rate and treatment for all cluster headache patients. I’d like to take a moment to address the community about our New Forums. Finally, thanks to everyone for their patience and understanding while we get everything all figured out. Please update any links, favorites, bookmarks, etc with the new address! 1) “Username” is not always the same as your “Display Name”. 2) If you are unable to login using your “Username” and/or “Display Name”, please try your e-mail address and password. In the event someone is having trouble logging in and/or resetting their account, please see if you can find their Username for them in “Members”. If you can, please provide usernames to people looking to recover. However, DO NOT publicly post anyones saved e-mail address. If a person cannot access the e-mail account that is registered to their Username/Display Name, they will NOT be able to recover their account and should create a new one. We will try to do everything we can to help people verify and recover their accounts if at all possible. Post Counts, Private Messages, Titles/Ranks/Status have all been reset. We can determine the new Titles, Minimum Posts, and Number of Pips (Dots) for each Titles/Rank together as a community. We do NOT have readily available access to your old PMs. We will try our best to restore access to your PMs on a per-message basis, at our ability and discretion. Setting your local time zone here changes the time on all posts to reflect correctly for your time zone. Clusterbusters is very happy and excited to announce the opening of a very important research study into the genetics of cluster headache. This study is currently recruiting people for possible participation. This study is a collaboration between Clusterbusters, Dr. Robert Shapiro, University of Vermont Medical Center, Dr. Guy Rouleau and McGill University. We are looking for individuals who have received a diagnosis of CH from a doctor, who have at least one immediate family member who also has received a diagnosis of CH from a doctor to participate in the study together. Two (or more) family members must agree to participate. We are currently contacting individuals that have joined our patient registry or completed a previous Clusterbuster’s survey and have indicated they may be good candidates through their answers and information. We will be contacting people in smaller groups so it may be some time before we get to you but we will be getting to everyone that is on our patient registry that meets the necessary criteria. Should you decide you’d like more information, you will be given contact information. You do not necessarily need to reside in the USA to be a possible participant. If you wish to be contacted to see if you are eligible to participate, you will need to first be a member of our patient registry. I want to start off by saying that Clusterbusters is of immense personal and professional importance to me, and that I truly want nothing more than to see it continue to succeed and grow as an organization. While the existing message board has been an amazing gift (and continues to be! ), it is time for us to build and grow from our home at Clusterbusters.org. They were very generous and provided us discounted migration services and support. This will allow us to better update, maintain, and secure the community into the future. 1) On the scheduled migration date, we will put the existing forums into a “Maintenance Mode”, which will make them inaccessible. 2) We will be working as quickly as possible with Invision behind the scenes to bring up the new forums: which will have all of the same usernames, passwords, and posts. You can save this bookmark for now, but the site will be inaccessible until it is ready!